In a conversation with a member of our church, she remembered the 1967 tornado that came through Waseca. Twenty-one tornadoes were sighted on that day in southern Minnesota. Her home, south of Waseca was hit by one of them. She heard on the radio that tornadoes were heading her way. She and her husband opened the windows of the house. This is what they had been told to do to relieve the pressure in the house. They just made it in time. They huddled in the basement and waited out the tornado. They could hear glass and lumber breaking and smashing. When it was all over, they went upstairs. The tornado blew all the windows out of their home and tore off the doors. Some part of something, a piece of a barn or tree, had gone right through their roof. She said it looked like a bomb had exploded. Death had visited their house, and they were spared. It sounds like what someone once wrote about London, during World War II, during the London blitz – people huddled together in bomb shelters, never knowing when the bombs would hit or where, wondering whose home would be destroyed next, and worrying about family and friends across town. Where would tragedy strike on this night? It must have felt like that to the people of Israel in Egypt 3,500 years ago. They were slaves, making bricks and dragging stones to erect the monuments that the Pharaoh was so intent on building. It was to this Pharaoh that God sent Moses with the message: “Let my people go.” Pharaoh didn’t want to hear it and told Moses – and indirectly, told God – to take a hike. Well, Moses reported back to God with Pharaoh’s answer. So God sent Pharaoh a plague. In fact, each time Pharaoh refused to let the people go, another plague was sent upon the land of Egypt. The river Nile turned blood red, frogs infested the land, flies worse than blackflies swarmed over people, cattle dropped dead in the streets, everybody got boils on their bodies, hail destroyed the crops, and locusts ate whatever the hail didn’t ruin. Finally, the sun refused to shine, and there was darkness over the land so severe, that no one could see anything. But Pharaoh’s heart was hardened, and he refused to let the people go. And then came the worst night of all, the most horrible Egypt would ever endure. A deadly plague visited the land, and cries of misery were everywhere as each family’s firstborn son died. It was an awful, terrifying night unlike any other night in their history – worse perhaps than the tornado, or the London blitz. There was no way to fight back and nowhere to hide. It must have been very painful for those Egyptians who lost children, and it must have been frightening for the people of Israel who huddled inside their houses, praying God would keep the promise and pass over the homes where they had smeared lamb’s blood on the doorposts. Life is difficult, and can sometimes be even downright cruel. We’ve all had our own long, dark nights – the loss of a loved one that was so painful; a shattered dream, or a devastating failure; an injury or disease or cancer that scared the very life out of us. But even in the face of that, we are a people who have chosen to place our faith in God. In a symbolic way, we are a people who have painted our doorposts with the blood of the lamb. As Christians we can’t miss the parallel symbolism here. 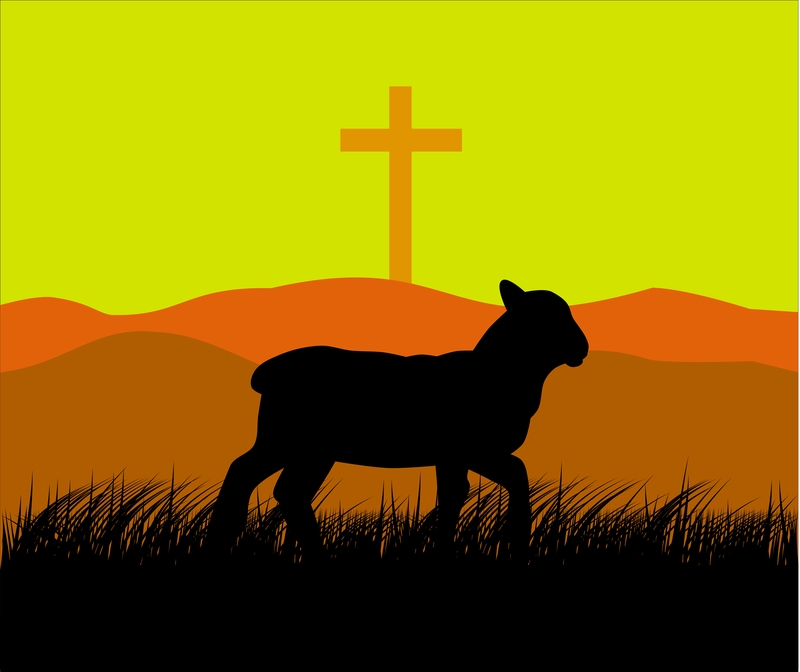 Jesus Christ, the Lamb of God who takes away the sin of the world, makes us the beneficiaries of a new Passover, a Passover from the tragedies of sin and death. That is not to say bad times and trouble will always pass us by. It does not mean all will be smooth sailing. I remember a children’s book that my parents read to me when I was little. I think it featured a character called Br’er Rabbit. Anyways, one line in the book sticks in my mind: “You can’t run away from trouble. Ain’t no place that far.” Isn’t that true? Life in this world will always have its share of troubles. The troubles for the people of Israel didn’t end the night of the Passover. They headed out and wandered the wilderness for 40 years. They had a heap of troubles. But they learned that God was with them. And they learned to trust in God. I could go on, but you get the idea. Life can be difficult, but God is with us. And we are called to be a people who trust God. And here’s the good news for today: We who have placed our faith in God will not be disappointed! No matter how dark the night, we will not be disappointed. Troubles are not the last word because we belong to God and we have this covenant, sealed in Christ’s blood, which says, “I will never leave you or forsake you.” (Hebrews 13:5) We are a people who have sought refuge in the Lamb of God, whose blood was shed for us. Sin and death may do their worse, but they cannot defeat us, because we are a people of the New Covenant in Christ Jesus.